Apparently just changing whether it was a +1 or not is not sufficient to officially characterize my last post as bringing you something “different” – as in something other than a bird post. I base this on the number of emails that showed up from my loyal readers essentially stating changing whether it was a +1 or not “is not something different”. I can take a subtle hint (okay, maybe it wasn’t that subtle). As a form of appeasement, I officially bring you something that isn’t related to a bird. Instead, today’s feature is likely something that would EAT a bird given the opportunity. Decided to do a quick check and sure enough, Foxes do eat birds so we can dispense with the likely. I must admit, that my bird knowledge far outweighs my Fox expertise. 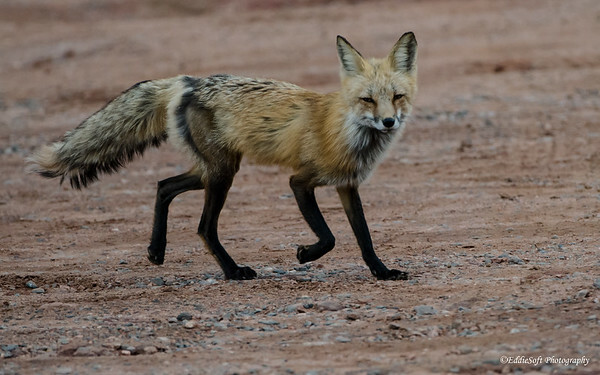 To the best of my knowledge bolstered by a healthy dose of Google searches, this specimen is a Red Fox. 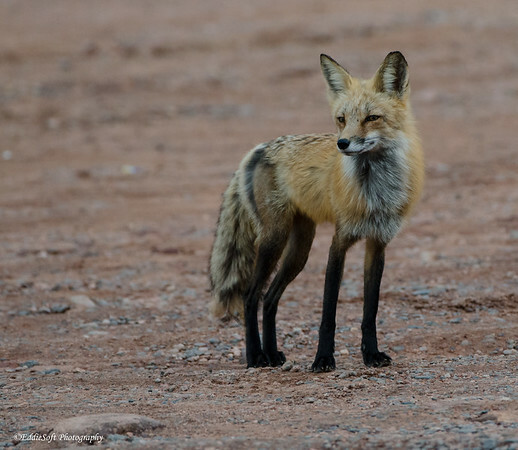 I was also able to find a few shots on the web that had the dark leg markings. That feature was confusing me a bit since our local Foxes do not seem to display that amount of darkness. The other interesting feature can be seen in the hindquarters. Hit the jump to read a bit more about this encounter!